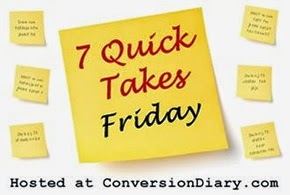 Since I have so many blog ideas swirling in my head but obviously can't seem to get them on the actual blog, I'm participating in 7 Quick Takes Friday. Maybe this will be a good way to get these things out. I spent last week with my husband and kids at a resort in Mexico on vacation. We had been planning for a while to do a beach getaway and finally just did it. My husband and I LOVE to take relaxing vacations, you know the kind where you lay on a beach chair with a fruity drink? The idea of packing up the family and trying to do Disney World exhausts me. I mean, the scheduling and rush rush all sounds too much like real life to me, not a vacation. Brian and I have done the Mexico resort relax vacation a few times before (LOVE IT) but without kids. The big question we had with this trip was could we relax on vacation with the kids? YES! Our kids are too much like us. They absolutely loved going to the beach, hanging by the pool, grabbing a fruity drink or two and even reading in the shade. The only scheduled activity we had each day was mealtime. And even then, it was pretty loosey goosey. We played on the beach, hung out in the pool, built sand castles and the adults found time to take a nap on a lounge chair. We didn't leave the resort the whole time we were in Mexico. No excursions, no nothing. Just downtime. I know that's not a vacation for everyone, but our family enjoyed it. 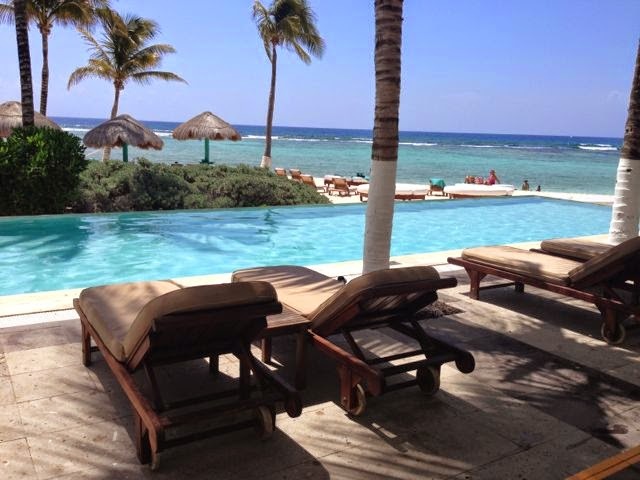 One of the best things about staying in Mexico for vacation was being unplugged for 5 days. It has been many, many years since we've traveled somewhere we didn't have access to email, phone or internet and I'll admit it made me a bit nervous. How would the world go on if I couldn't text, email or check Facebook? Yep, I've obviously got a bit of an addiction problem. No phones, no internet, no texting, nada for 5 days. It was so liberating. For the first two days, I found myself reaching for my phone throughout the day to check something or just when I was bored. When I confessed it to Brian, he laughed and admitted he was having the same problem. The big joke at dinner time when the kids would ask us a question was, "I'd google that, but wait, I can't!" And you know what? The world went on even though we didn't get the answer to that seemingly important question. You know what's funny? When we landed back in Houston I didn't want to turn my phone on. I'd enjoyed being unplugged so much that I didn't really want it to end. Without my phone I was able to enjoy what was right in front of me and focus on the present without worrying about what I should be doing or what I was missing. Not being connected 24/7 gave me the opportunity to just relax. I know there is a big life lesson in there for me that I am trying really hard to grasp now that I'm back. Watching the games, we learned so much about soccer strategy, penalty kicks and witnessed feats of amazing athleticism. And I discovered how much my kids already knew about geography! Birdie was always quick to tell us what countries bordered the country in question, what language they spoke and something else interesting about it. Who knew?? As an added bonus to this new family watching event, my girls now throw things for my son to hit with his head (think Webkinz flying across the room for him to "head" into a make believe goal). Quite funny. My kids leave for summer camp this weekend. All three of my kids for a whole entire week. What in the world??? I think my excitement of having a whole week to myself (and with my husband of course) is muting any anxiety of my youngest going away to camp for the first time. The kids are really, really excited to go back to The Pines Catholic Camp in East Texas and I'm excited for them to have a great camp experience that is also filled with faith. 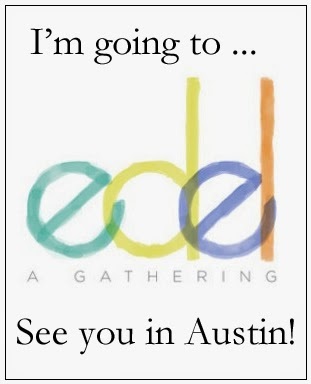 Have I mentioned that I am going to the Edel Gathering in Austin in two weeks? It is a weekend getaway retreat for Catholic moms created by Jennifer Fulwiler of Conversion Diary and Hallie Lord of The Moxie Wife. I'm excited and extremely nervous at the same time. While I'll know a bunch of women in attendance, I don't have a close friend or my sister going with me. This will force me to get out and meet so many new women, which is a great thing. It just makes me a little bit nervous in advance. I did manage to score a wonderful roomie - Lisa Schmidt of The Practicing Catholic. Not only does she have the best name in the world, she is a crazy nice and fun person. I'm really looking forward to spending time with her over the weekend. AND, there is this shoe thing! At the Friday night cocktail party, they are giving an award for crazy shoes. So much pressure! What to wear AND now I have to think about shoes?? Geez. Of course, I do have these turquoise heels with bows that I bought on a whim 2 years ago and have never worn. Is it too much to try to find an outfit to match turquoise shoes? Books! While on vacation I started and finished three books. The first was The Sign of Four, a Sherlock Holmes novel by Sir Arthur Conan Doyle. Since I've been watching the Sherlock Holmes series by BBC on PBS Masterpiece, thought it time to pick up my first Holmes book. It was so much better than I expected. A very good detective story that has held up over the last century. While reading it I kept thinking that Benedict Cumerbatch really nails it. The second book was one already on my Kindle and on a whim I started it. The Shadow of His Wings: The True Story of Fr. Gereon Goldmann was something I just couldn't put down. It is the "astonishing true story of the harrowing experiences of a young German seminarian drafted into Hitler's dreaded SS at the onset of World War II." I don't want to describe it much more than that and give away his entire story in case you don't know it. That's all I knew when I started the book and was startled by the turn of events throughout Fr. Goldmann's life. The most improbable things happen to this young seminarian attempting to follow God while serving in the Nazi army and SS in World War II. Stuff this crazy only happens in real life. And as an added bonus, the epilogue reveals the work God called Fr. Goldmann to after the end of the war. This book is worth reading. My last book was a recently released fiction thriller called, The Code Within by SL Jones. It was a pretty good read if you like Vince Flynn and Brad Thor's books. There was a little too much computer/technical jargon, but the lead character was charismatic enough to keep me reading through several more books. This is the first book in a new series so I will reserve my final judgement until the next in the series. Now I'm off to start Ken Follett's Fall of Giants: Book One of the Century Trilogy. What are you reading this summer? I guess my Seven Quick Takes should be called my Seven "not so quick" Quick Takes. How is your summer going at this almost mid-way point?